MCS Awareness days, weeks, and months, along with government proclamations have been going on since at least 1998! It has taken a lot of effort from a lot of people over a lot of years, and for some of us, it doesn’t seem to have made a great deal of difference in our daily lives. The world is even more fragrance contaminated than ever, so many other products and materials are more toxic than ever, safe and affordable housing is even harder to find, and now wireless devices are everywhere filling our spaces with unprecedented of amounts of radiation on a 24/7 basis. We canaries are still waiting for actions that allow us to live life without being subjected to health and ability harming exposures all the time. Yet, there is more awareness about the need for safer products and materials, and more are being developed, although not specifically for the communities who are more “sensitive” than others and can detect undeclared contaminants. I am looking forward to the day when we don’t have to keep having awareness days, weeks, or months, because everyone will know what causes MCS/ES, and how to prevent MCS/ES, along with how to address the needs of people who have already developed MCS/ES. If you are up to it, and feel so inclined, please post any 2017 Awareness actions you are aware of into the comments! Our voices together have the power to create healthy change! 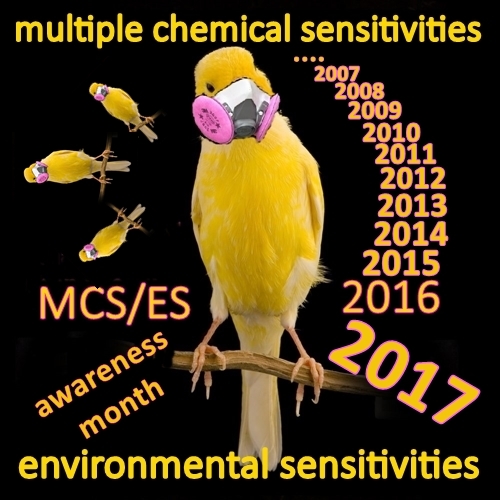 This entry was posted in Education, Environmental Health, Environmental Sensitivities, Human Rights, Multiple Chemical Sensitivities and tagged awareness month, chemical sensitivity, EHS, MCS, multiple chemical sensitivity. Bookmark the permalink. Ah, May. Lots of awareness! I love this canary meme so much! So much awareness (day, month, week)! And thanks! Did you click on the link for 1998? There’s even a statement from Bernie Sanders there!!! wp is disappearing the fb links now – hopefully the page link will show up. Here are some images you can print off and tape to any accessibility barriers you encounter when you are out and about!